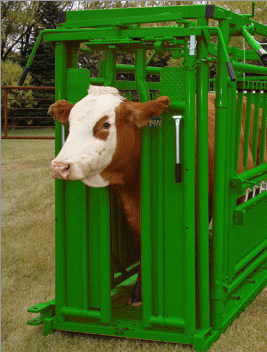 The Real Tuff Cattle Head Gate can be quickly and easily adjusted. It’s automatic/self-catch (when the cow goes through, the head gate resets itself), and is adjustable from 4″ to 10.5″. We also offer a head gate with neck extender which provides great access to the injection area, it holds the head more secure for implants, ear tags, shots, etc. impact when the animal goes through the Neck-door. Operates from either side to accommodate a left or right handed person. A cattle head gate allows the cow’s head to pass through but blocks it’s shoulders. This position allows easy access to work cattle in the chute. Since we love our automatic reset head gate, it’s included standard on all squeeze chutes, portable handling systems, hoof trimming chutes and 1/4 circular maternity pens. Customers may this piece separately as well. While this piece accommodates a variety of cattle sizes ranging from calf to bull, we recommend cattlemen sort their herd first. Running calves together and then larger cattle later will save time and require less adjustments. Also note that our optional neck extender is welded onto the livestock head gate instead of bolted which increases the strength and improves operator safety. If cattlemen choose to upgrade to a cattle head gate with neck extender, just remove the current head gate and slip on the new one. 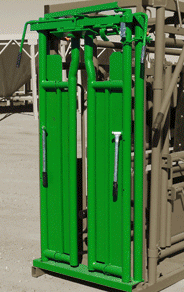 Many customers choose to a head gate with neck extender if neck stability is necessary. Real Tuff was honored when Storey Publishing approached us to feature our cattle head gate in Temple Grandin’s Guide to Working with Farm Animals book. Real Tuff proudly announces our newest addition to our equipment, the livestock Headgate Helper. The livestock Headgate Helper allows you to close your headgate from the back of the chute. When you have a docile cow or a cow that enters the chute multiple occasions over a period of time, they may push the cattle headgate forward but not quite latch it. 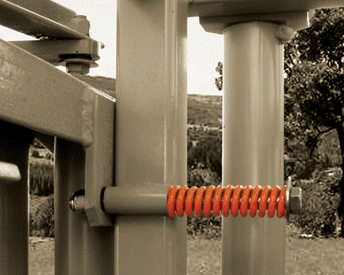 The back handle of the this helper fits right into the bracket of your Real Tuff Squeeze chute. The front of the helper attaches to the front beam and works like a “T” to shut the cattle headgate. This saves time and frustration. The cattle headgate helper will shut the headgate even when the cattle headgate is completely open. It’s called a livestock headgate “helper” and it truly is a tremendous help for closing the headgate! Want help deciding what livestock equipment is right for you? Interested in pricing? Contact Real Tuff at 218-776-3188 or 800-474-6016 or send an email to: dahlberg@realtuff.com. Please include your zip code when sending an email message. Download our Head Gate Helper instruction sheet for more information.